When Barbara Araujo and Allan Alves got married three years ago, they had big plans: open a business, buy a house and start a family. But with Brazil plunging into its worst recession in over two decades -- hopes for a brighter future are fading. The Brazilian economy shrank 3.8% in 2015, according to government data published Thursday. That's the biggest annual drop since 1990 and the country is in its longest recession since the 1930s. "I have never seen anything like this," said Alves, 24, as he stood on his balcony overlooking Rocinha, a massive lower middle class neighborhood or favela in Rio de Janeiro where he grew up. "My parents would tell me about hard times, but today it is really tough. Prices are going up every day." 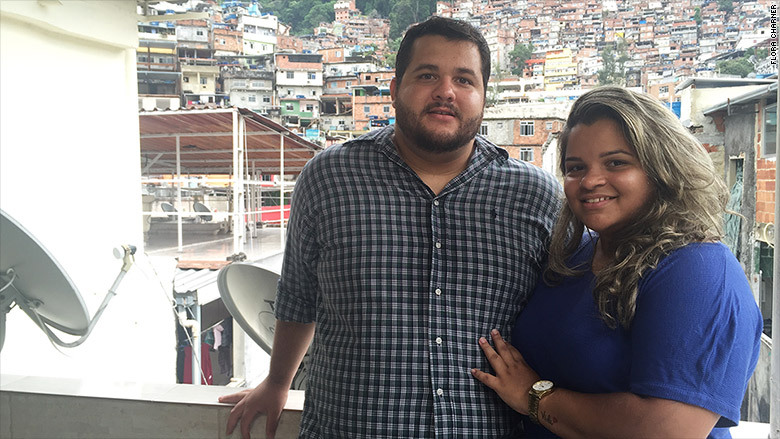 The high school sweethearts both started working when Brazil was reveling in its golden age. Barbara Araujo and Allan Alves outside their home in Rio de Janiero. In 2011, the South American country was the world's sixth largest economy, surpassing the United Kingdom. Large oil reserves attracted development and foreign investors, and China became its top trade partner. Brazil emerged from the global financial crisis largely unscathed. Now the good times are over. Unemployment is rising, consumer confidence has plummeted and the country's currency, the real, has lost 24% of its value against the dollar in the past year. The engine behind Brazil's economy is commodities like oil, sugar and coffee. Prices for all of them have plummeted over the last two years, hurting Brazil badly. An unprecedented corruption scandal at the giant government-run oil company Petrobras was another big driver of the recession as Brazilians' confidence in the government and business plummeted. The massive bribery investigation led to the arrest of dozens of executives and politicians involved in the billion dollar kickback scheme, which prompted to the opening of impeachment proceedings against President Dilma Rousseff last year. The country's economic woes have hurt Brazil's once booming lower middle class -- folks like Araujo and Alves -- the most. They both lost their jobs last year. After hitting hard times, the couple started a side business selling chocolate cake pots. In the first few months, they sold 200 pots a day at 5 Brazilian reals a piece (roughly US$ 1.25) in their own neighborhood. Business was good. But with inflation reaching its highest point in 13 years, ingredients have become more expensive and their usual clientele can no longer afford the tasty treats. It's forced them to seek customers who can pay higher prices outside their neighborhood. Plans of opening a bakery, even purchasing an industrial grade mixer, have also been postponed. A white motorcycle, which they had been bought on credit to help with deliveries, is still being paid off in monthly installments. And the payment is becoming harder because interest rates in Brazil keep rising. "Everyone is worried about this," Alves said. "As interest rates go up on food, electronics and other goods no one knows how they will pay these things off." 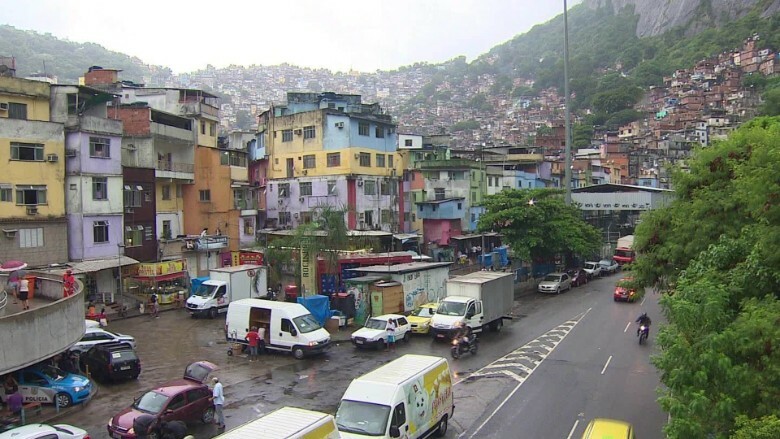 Many of Rocinha's 200,000 residents benefited from subsidized housing and government lending programs, like "Bolsa Familia" (or "family allowance") which is credited with helping millions of Brazilians rise out of extreme poverty. The favela they live in. Businesses throughout the favela and other Rio de Janeiro neighborhoods have been closing their doors, even as the city prepares to host millions of people during the upcoming 2016 Summer Olympic Games. A recent study by one of the city's largest storeowner associations showed that more than 1,200 stores had been forced out of business in 2015 due to dropping sales and rising rent costs. Despite the country's bleak outlook, Araujo and Alves are hopeful about the future. "There is a lot of uncertainty...at this point, all we can do is save," Alves said. "But I'm still hopeful that I will be able to provide more opportunities for my [future] children."